Today we're sharing an excerpt from The Heart of the Game by Pamela Aares! Zoe wants nothing to do with her family's new home and vineyard in the California wine country. Every day spent in exile from the world she loves in Rome feels like an eternity. Her heart's set on returning to Italy and opening the art gallery her late mother always wanted. But the passion Cody fires has her second-guessing her plan and her dreams. Just as they open to love, Zoe's family is caught up in a dangerous web of Mafia crime. To protect her, Cody must swallow his pride and turn to an ex-CIA operative for help—his estranged father—even as he suspects that Zoe's family is involved in foul play. But will Zoe’s stubborn determination, Cody's inability to trust, and the criminals threatening the Tavonesi family kill any chance for the world-altering love they’ve discovered? The music shifted in tone and pace, and Cody turned once again to the back of the courtyard. There, dressed in a pale green flowing dress with a crown of flowers on her head, stood Zoe. A shaft of late afternoon sunlight poured in from a high window in the castle walls and lit her face. Zoe had been lovely in his dreams, in his memories and fantasies, but nothing had prepared him for her to look like a goddess. Or for the dizzying buzz in his head, in his chest—hell, in his whole damned body. He put a hand to the back of the chair and felt it wobble. Using the practiced focus that allowed him to drown out unwanted noise when he stood at the plate, he swallowed in a long, slow breath. As if following some sort of cue, Zoe started down the aisle. She walked with a killer combination of athletic strength and floating grace. The tremble in the hands gripping a bouquet of flowers was barely noticeable. But it made him want to rush into the aisle, scoop her into his arms and carry her away somewhere. Anywhere. He shifted and found Scotty staring at him. Whatever “it” was, Cody wished his emotions weren’t so damned easy to read. But pitchers and catchers spent long hours learning to read each other, sending signals beyond the obvious calls for pitches and strategies. Cody shrugged and watched as Zoe walked to the end of the aisle. And tried to pretend that the sway of her hips didn’t have him reliving one of his raciest dreams. When she reached the left of the archway, she turned to face the crowd. A gentle smile curved her mouth, a smile that reminded him of women in Renaissance paintings. A smile that hid as much as it conveyed. The bouquet in her hands still trembled. Only very slightly, but his heart did a little flip for her. He knew what it felt like to stand in front of lots of people and have emotions you couldn’t hide be on full display. She scanned the crowd, and for an instant her gaze found his. In that brief moment, he felt held. Captured. Hell, maybe even owned. It was a weird feeling, one he hadn’t expected and didn’t know how to classify or gauge. Her smile didn’t alter as she flicked her gaze to the aisle, and he shook off the odd sensation. The music swelled and the crowd turned their focus once again to the back of the courtyard. Reluctantly, Cody pivoted with them. 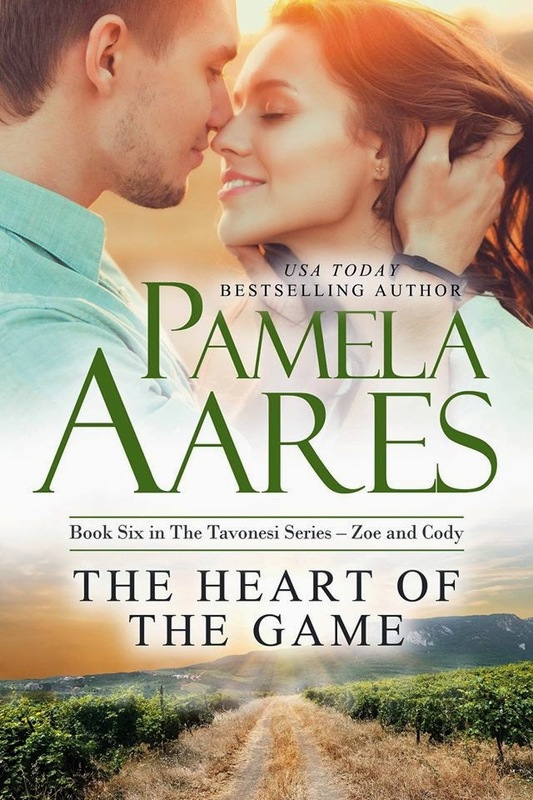 The Heart of the Game by Pamela Aares is a contemporary romance, released on March 11 2015.